MJN.M.MX.MG (Distributing Valves) | Products | Daikin Lubrication Products & Engineering Co., Ltd.
A total of seven types of distributing valves are available: MJN, M, MX, MJNO, MO, MXO, and MG. Distributing valves comprise a inlet　element, end element, middle element (minimum 3 - maximum 8), and a gasket. • This is a progress operation system. • Piping is done by single line. • Indicator alarms can be attached. • As operating parts are built-in, these valves are sturdy and resistant to water and dust. 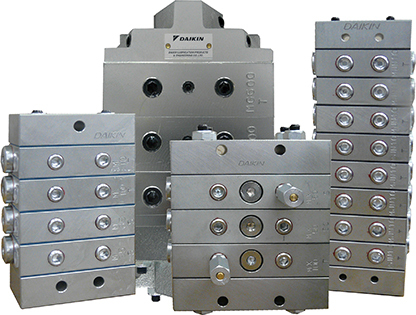 • You can select from 2 up to a maximum 16 discharging ports for each distributing valve assembly. • Various spool sizes are available corresponding to the required amounts of grease or oil at lubrication points, which enables lubrication by appropriate quantities. *The grease used is NLGI consistency #0 to #1 for centralized lubrication.